Well the answer is… you don’t. LWC is designed with a one way data binding approach. Initially this can feel frustrating, especially for people who have come to love the simplicity two way. Let’s review what two way binding is before looking at one way binding. Whilst doing this is great, there are some downsides to two way binding. There’s a lot of complexity to support it behind the scenes, mostly from how to handle a chain of events that may be triggered from a change in the UI. This is one of the reasons that other frameworks like React, Knockout, and now Lighting Web Components, implemented one way binding. One way binding means that the model is rendered in the view, but in order to update the model if the view changes, you must fire an event and handle that event to update the code in your controller. 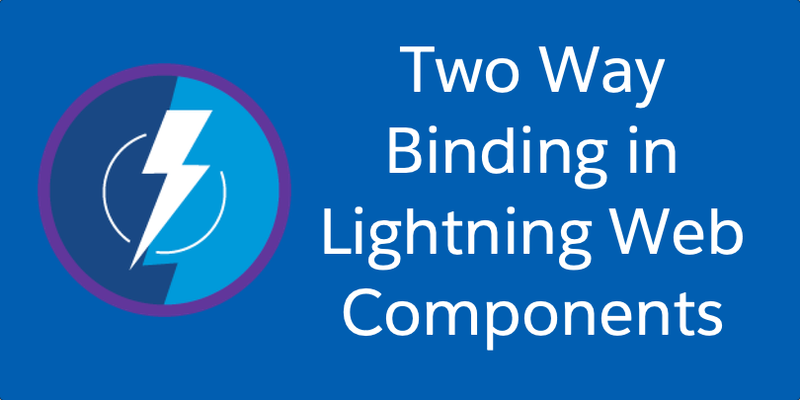 Let’s walk through an example to see how this works in Lightning Web Components. This is our simple LWC class. It uses the @track decorator to tell the LWC framework that our name property is reactive – i.e. that LWC should re-render the component when it changes. Another incredibly cool product that came out with LWC is the Playground where you can quickly test some simple components without deploying to an org. And that’s because we have only one way binding. So how do we get the changes to update the model? We need to add an event listener. And now we can see the value is automatically updating as we change the text in the field. Obviously this is a very simple example and as you create more and more complex applications how you represent state will get more complicated too. So one concept from React that I’ve found helpful as more and more components get nested is called Lifting State Up. In a future post I’ll cover how this looks in the LWC world.